Superb exposure is important for safe early morning as well as evening strolls with your canine. It's also valuable for hiking, camping, searching as well as spotting your canine in a big backyard. 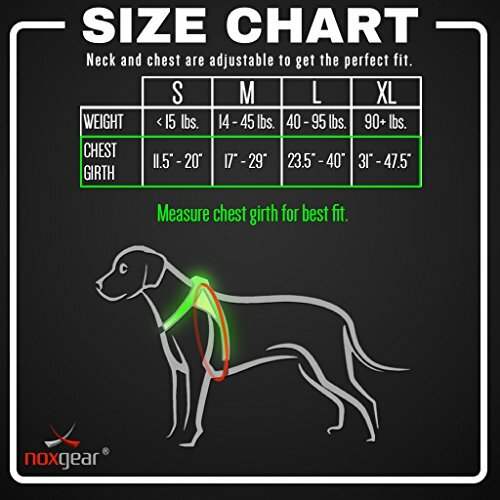 Brighten your pup with unrivaled illumination, reflectivity as well as fluorescent color with Noxgear's LightHound canine vest. The vest includes focus grabbing, multicolor blinking settings based upon visual science (as well as solid colors). In the rainfall or shine as well as any kind of season this incredibly light-weight vest is long lasting as well as all set for activity. Perfect for strolls, walkings, camping as well as searching trips, backyard fun as well as all type of outside expeditions. Lighting lasts for over 12 hrs as well as is powered by a mini USB rechargeable lithium ion battery. The LightHound vest is simple to move on, change as well as utilize with journalism of a solitary button. 4 dimensions are readily available as well as each is straightforward to change over a wide variety - so you always obtain an ideal fit. The vest is device cleanable as well as simple to clean. It'll soon replace your favorite canine harness or collar. Select dimension from drop down to see regular breeds. ALL THE COLORS IN ONE VEST - Change between 8 super bright solid colors - Red, Yellow, Magenta, Blue, Purple, Pink, Green, and Cyan AND 6 eye catching multicolor flashing and slow fading color modes. Our special illumination modes are based on visual science to give visibility to your pets and warning to motorists. Modes are easily selectable at the press of a button, easy to access during a walk, run, or backyard fun. TRUE 360 DEGREE ILLUMINATION, REFLECTIVITY, & FLUORESCENCE - Visible from over half a mile away, never lose sight of your dog again. 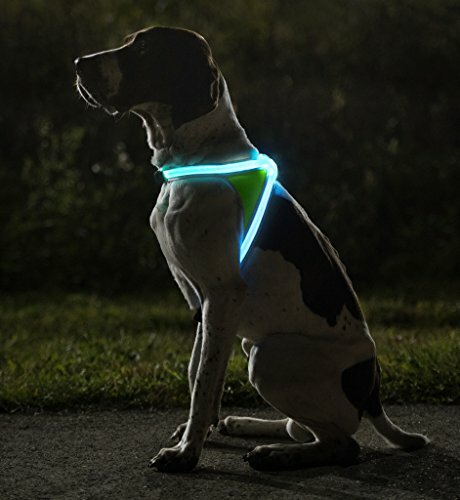 Unlike other reflective animal vests and hi viz gear, our flexible fiber optic cables, and 3M Scotchlite reflector technology actively keep man's best friend safe by alerting distracted drivers and traffic before their headlights are on you and your pup. Day or night, morning or evening, rain or shine, let your dog out of the house worry free. NO BATTERIES, NO SMELLS, NO WORRIES - A quickly rechargeable, long lasting battery, means up to 12 hours of illuminated playtime. 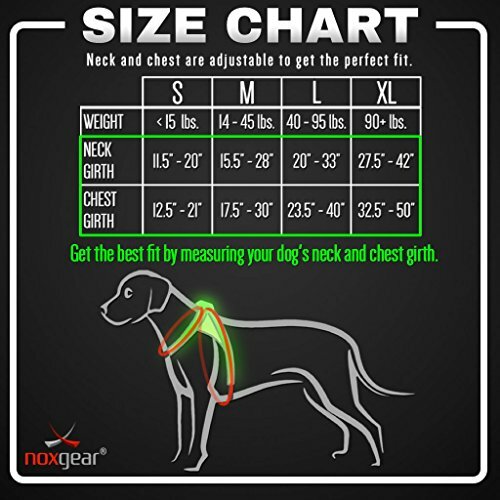 Spring, Summer, Fall or Winter, the lightweight, breathable design allows your puppy to wear it year round. Built to be durable with military grade Cordura fabric and 3m reflective bias, this vest can withstand rolling, adventures in the rain, or just general wear and tear. When it does get dirty, cleaning is easy, just throw it in the washing machine. GOES ON QUICK AND EASY - The newly re-designed harness with added leash attachment makes it easier than ever to clip-in and be out the door. Already have one that you love? 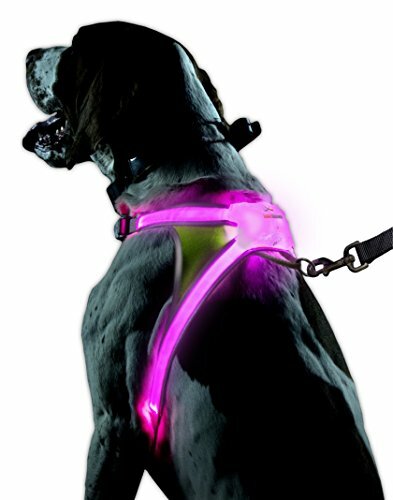 The Lighthound will quickly slide over your favorite dog collar, harness, or jacket and not interfere with the leash or other dog gear. HIGHLY ADJUSTABLE - A unique vest for a unique companion. No need to compromise comfort for safety, both the neck and chest are adjustable to get the perfect fit. Slide it on, clip in, and simply adjust, and it's ready to go, without fear of rubbing and chafing.